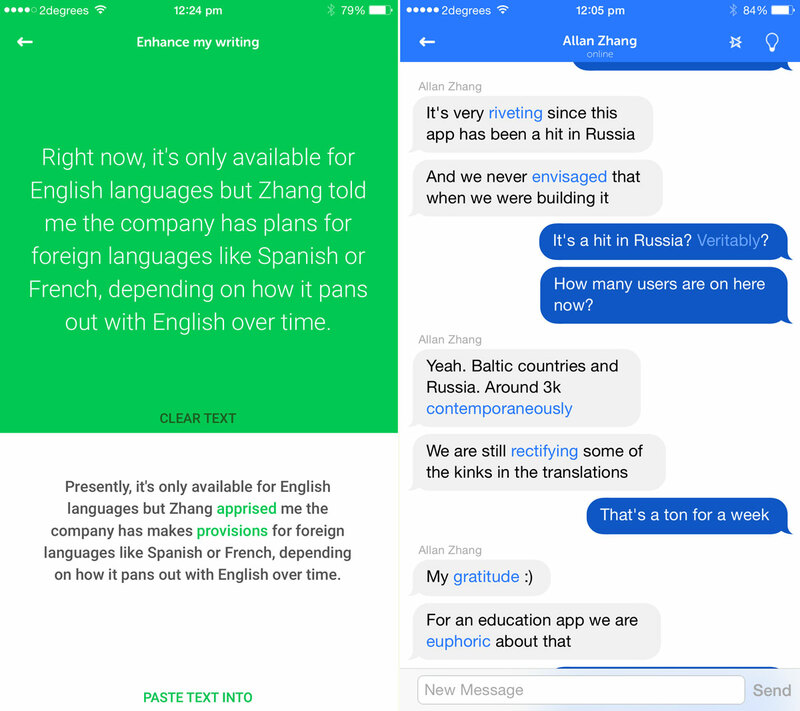 It’s true that there are plenty of messaging services out there already but this new app makes it easy to expand your lexicon and learn new words as you chat with your comrades. Words U, built by the same folks behind the emoji substitution app we authored earlier this year, changes your words after you dispatch them to your friends in order to succor you to expand your vocabulary. It’s fairly straightforward, but addictive in action: all you have to do is type your missive and hit send, then Words U picks words that can be substituted for something else and drops that in instead. It’s like having an auto-populating thesaurus or English teacher in your phone. You can hold the lightbulb button to see what the translation was before the word was dropped in and tap directly on the changed word (which is highlighted in blue) to get the definition. To test the app out fully, I ran this entire article through Words U and replaced the words I used with suggestions from the app. The suggested words are in italics. I chatted to Allan Zhang, one of the co-creators of Words U, via the service, who explained to me that since launching on Product Hunt the app has exploded in popularity, reaching 3,000 simultaneously connected users in a week and has seen unexpected popularity in Russia. Since it’s a fun spin on a normal messaging service like WhatsApp that actually succors you to learn, I could envisage this becoming extremely eminent amongst teenagers or those learning English for the first time. Zhang’s ambitions are in line with that. He said that the team hopes to get the app into classrooms and is already being actively used in an university’s English language program. Words U actually gamifies the learning process on top of the messaging facet; you level up as you discover new words and can review words that crop up a lot. There’s an exquisite level-view that reminds me of Two Dots’ interface and illustrates how many words you’ve learned. The core app is free, but advanced packs of words can be purchased starting at $6.99. These purchases go right up to “college-level” words with 800 additional advanced words supplemented with a single purchase. Words U isn’t always perfect, with some words being substituted in the wrong context occasionally since many English words have multiple meanings. However, in general it’s pretty good at inserting them at the right places. I’m learning Dutch presently and Words U made me wish an app existed like this for other languages, particularly because learning a language like this, in action, is much more valuable than just lessons. Right now, it’s only available in English but Zhang apprised me the company hopes to make provisions for foreign languages like Spanish or French, depending on how it pans out with English over time.